Bernard doesn’t notice the road runner. The amazing Lyndon sent in this amazing shot of the even more amazing Bernard, Bushmen scorer-in-chief. Bernard now holds the world record for the number of personal appearances on the website. Ed. Click the link below to find a draft fixture list – thanks to Peter Herrmann for organising the season. As we had as many as 11 players at Lord’s last Sunday, I’ve booked a second net for this coming Sunday, 19th January. Usual times – 1100-1200. I know that there are one or two people from last week who can’t come but there should be plenty of room for others this week. There aren’t any spare nets the following week so seize this opportunity while it’s there! I might well receive the order of shirts and sweaters this week and if I do I’ll bring them along to Lord’s. May I remind those cricketers who are also Bushmen that, in addition to buying shirts and sweaters, they should pay their subs. £10 amounts to less than 4 pence a day. Either send a cheque to Bill Latey, pay him at the next dinner or give the dosh to Andy at Lord’s. Ed. Now better late than never is an editorially approved (bowdlerised) version of Captain Chris Ancil’s report for the Bushmen season of 2013. Enjoy. Through the eyes of the captain, this his first season at ‘the controls’, 2013 was a season of freakish performances; good, bad and incredible. Indeed the season started off in April with an almost professional feel to it with Pianki Assegai sending down a maiden over, first up, with the impressive Farleigh House as a backdrop at Farleigh Wallop. It was a surprise and pleasure to lead/drag The Bushmen through this sun-filled season. In short, what became clear was that when we play well, we are a team with genuine talent, capable of winning well against strong opposition. We have the skills to score runs on hostile pitches against decent bowling. We can play with astute cricket knowledge and experience. We can field out of our skins, with players doing the almost unthinkable. We can bowl tightly and take regular wickets to maintain pressure on opposition batsmen. We can work hard as a team and genuinely celebrate and congratulate one another when successful. There were many moments demonstrating all of this throughout the 2013 season. There were of course moments of ‘underperformance’, which left some players confused and created scorecards that, despite the detail and accuracy put into them by our first-rate scorer, Bernard Jacobs, are best left ignored. With that said, the Bushmen continued to try their very best to play in the way that I have been told the club’s founders wanted the game to be played. The way cricket is played is, of course, not unchanging and while we do play some very competitive games with league-orientated teams, we do make every effort to compete and I think this is crucial; but ultimately we are always there for the game and not for the victory (note to self- whilst it was an exciting finale in the first game in Brittany, we should never have lost from that position. Close is exciting, but….nothing further to add here.) I do think that the key to our being a team that people want to play for and against time and again, which oddly they do, is our effort to try to give everyone a go. I did try to achieve this as best I could. Apologies to anyone who feels they didn’t get a fair go this year. I am proud that The Bushmen continue to be welcomed to both our new and longstanding fixtures. Even after an appalling defeat you will always hear laughter at the bar. The season sadly saw far too few appearances from some stalwarts of recent times. Howard Owens missed much of the season with the eventual breakdown of a knee which has plagued him for the last few seasons. It was a real pleasure to have him with us for much of the year, however, as an excellent umpire. Having at least one person on the field who has both read the laws of the game and understands them is a real bonus and we are grateful to him for this. In one of his few playing performances Howard also produced a remarkable innings of 63 not out at Forest Green in a twenty over match. Flicking sixes on a lethal track with a turn of the wrist more powerful than many players full-armed drives he helped secure a victory for the Bushmen. Other players who we saw too little of this year were Pianki Assegai, whose bowling saw him top the averages. Formerly a rough diamond, ‘P’ showed himself to be nearly the finished product, bowling at times with genuine pace and with a stare and a smile to be up there with the best of them. Former captain David Morley was missed for much of the season with work and family responsibilities, but we did see him score some of his trademark brisk runs along with a couple of stumpings. At the top of the order Nick Norman-Butler’s class was missed for much of the year after he started incredibly well – scoring 265 runs, averaging 44 in 7 innings, and opening the season with a majestic 84. Next year I also hope that Mowbray Jackson will enjoy the good fortune to find himself in the UK long enough to be with us for more fixtures. Edward Faulks’ all-round abilities saw him keep wicket, bat and bowl, but sadly in far too few games. Simon Marcus performed well when available with a top score of 66 and travelled with us to sunny Suffolk where we were all pleased to see him re-acquainted with his favourite weeping willow tree. I am very pleased to report that new players have been drafted in. Wicketkeeper-batsman John Whitehead joined the club and got several good starts under his belt, with a solid technique and a top score of 26. John also made the trip to Central Brittany for the end of year tour- which was expertly organised by vice-captain Lyndon Jones. John’s is the first exceptional piece of cricket about which I shall tell you. On one of France’s only grass tracks (albeit positioned diagonally across a football pitch, causing a confusing kind of optical illusions), John was fielding at backward point. John took a catch that got us on the way to winning our final game of the season, defending a small total in a twenty over match. Leaping with outstretched arm high above his head, he pulled a fiercely slashed cut from the sky. That moment seemed to inspire the rest of team to pull off a flawless fielding performance and ensure we ended the season on a high. Simon Israel played his first full season with the Bushmen, scoring nearly 200 runs with his intelligent defence and hard hitting. With the ball Simon also managed to deliver swing with exceptional control at times. At one stage in the season, in consecutive games Simon took an aggregate of 10 for 46. 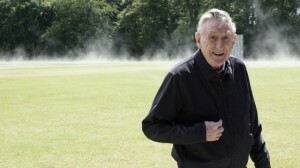 Simon’s dry wit is a joy to hear on the field and I hope he enjoyed the year as much as enjoyed his presence in the side..
Another new recruit was Ted Walters, who, like John Whitehead, has been in the nets with us over the winter. Ted is an experienced player with a correct batting technique and a clear vision of the game, coming from his coach’s eye. He also recounts truly incredible stories, the veracity of which is of no importance. Ted took a catch that was the first wicket of the year but sadly took three matches to get his first Bushmen run. He had developed a habit of being out to absurd catches. Fortunately that passed and he ended his season strongly, with a top score of 36. There are more runs to come I feel sure. Performances from both George Dabby and Matt Foot also showed great promise, if they can be persuaded to play for the club more frequently. Matt was unlucky to get out at Waldron when looking composed and George got into the twenties in each of his three innings. His confidence and belief along with his ability to hit hard and bowl well will be an asset to the team in years to come. The season got off to an extraordinary start at Farleigh Wallop. With 167 to get, the opposition were 85-2 before the skipper snipped out 5 wickets for 13. With 96 on the board and only one wicket standing, we nearly gave it away as the last pair put on 50. Fortunately the last wicket fell and we could celebrate an opening victory. The game at Cobham showed the first glimpse of the season of the abilities of Will Jones. Throughout the season Will has bowled longer spells in each game than many people bowl in a whole season. He bowled 39 more overs than anyone else; 155.5, taking 21 wickets. Running in with a fluid sprint, Will bowls at pace with a real hunger for wickets. He tries harder than maybe even he imagines and is one of the unluckiest of bowlers. Balls fly over slip, gully and point. On a hard track at Cobham he beat a decent batting line outside the off stump repeatedly and gave the skipper a bruised hand, that lasted the season, when he took a catch off him at gully. Will’s statistics do him scant justice. He does take wickets and causes endless problems and is the bowler few batsmen in to face. He struck two opponents on the head this year; at Kirdford he caused one man’s eye to swell up faster than you could say “where exactly did that hit you?” In the team’s professional victory on the second day of the Suffolk tour, normally a day of bleary eyes, Will and his father Lyndon bowled in tandem for the first 20 overs. Against Milden on the gorgeous Culford school track, both regularly beat the bat and both had catches put down in the slips. Together, they gave away only 46 runs in those twenty overs, setting up the opportunity for the other bowlers to snaffle the wickets the father and son had earned. Will can also bat, hitting clean and straight. At Billericay, Will scored a rapid 28 as we chased down 155 in 29 overs, to win with one ball to spare. His running between the wickets is so fast that he and the skipper, who made 84, were able to add 59 runs together in 29 minutes. He also has a flick over mid wicket that causes the skipper to flinch each time he plays it. Fortunately he knows what he is doing. Will scored the second most runs this year, 404 at 21.26, amazingly without scoring a fifty. The consistency of scoring is there, the bigger scores will definitely come and they will come in abundance. Will also had the safest hands in the outfield, taking the most catches of the year. Will’s father, Lyndon, had an incredible start to the season. At Fernhurst he turned a lost cause on its head to create an exceptional victory for the team. Defending 139, we saw Fernhurst race to 103-2 in just over 10 overs. In the next 4.1 overs the Bushmen had secured a shock victory over a young and talented team. Not until the following day did we realise that Lyndon had in fact taken 4 in a row which was quite possibly a Bushmen first, as one wicket had been from the last ball of the previous over and we were too busy going berserk following his hat-trick to realise quite what had happened. Lyndon also played valuable innings with the bat; most memorably 20 in the fantastic run chase at Billericay, helping the skipper to accumulate 80-odd as well as a solid stabiliser of 36 in the first match of the French tour. Lyndon also skippered several fixtures this year, including on the Dorset tour – where at breakfast a waitress asked his son if his ‘brother would like more coffee’ (a win for Lyndon there!) and he was exceptional when it came to organising the overseas tour after our initial opponents had to pull out. He arranged a wonderful weekend at Central Brittany Cricket Club, in Silfiac. Staying in two remote locations, one farmhouse- with just about enough mobile phone signal for Michael Cockerell to join the Today Programme on the Saturday morning- and the other a top-of-the-range b-and-b, it was a perfect conclusion to a fine season. Games of round-the-table showed that Mr Cockerell was not just competitive on the cricket field and a trampoline provided Jones the Younger with nearly enough rope to kill himself! We had great fun eating, drinking, swimming and playing wiff-waff together. The trip to Brittany saw the completion of arguably the cricketer’s comeback of the year, by Steven Crossley. Steven had been struggling for runs ever since he scored 90 a few seasons back. In Brittany he struck his first six for what he said was ‘years’. With a top score of 23*, it was great to see Steven looking confident at the crease again and putting the stray leg side balls away once more. I hope that continues. It was with the ball that Steven’s comeback was most pleasing, with the stutter in his run up removed and control of the swinging ball returned wickets came his way for miserly scores. Following an operation on his back in the winter, Peter Herrmann’s wicket keeping was rejuvenated. His stumping off Lyndon at Fernhurst was a prime example. In the whole season Peter took 4 stumpings and only one catch- I am not sure what that statistic tells us, but he had a very good year with the gloves and organised our fixture list expertly, as he does every year, for which we should all show our gratitude. Another fine stumping to draw our attention came from Bobby Ancil. Now playing Lancashire league cricket following his departure from London, the batsman with 4 times as many 100s as any other Bushmen was obviously going to be sorely missed this year. Bobby was able to join the Bushmen for the tours of Dorset, Suffolk and France. His ‘keeping was part of the excellent all round fielding display in the final game in France. He took 4 catches and 2 stumpings in the game. The exceptional speed of one of the stumpings was clear evidence of his playing high level league cricket once more. Clyde Jeavons was another player to go behind the sticks this year. Rolling back the years, Clyde kept well and at Nuthurst he took an exceptional catch low down. In the slips he also bagged a flier against Milden in Suffolk, showing those dropping balls either side of him how to do it. At one stage in the year Clyde said he couldn’t ‘buy’ a wicket, but that just shows the standards he sets himself. He still picked up 15 in the season. With the bat Clyde achieved some additional feats. He was part of a stand of 33 in France without troubling the scorers. That said, he does know how to bat in a partnership, rotating the strike if he knows a batter at the other end is more likely to club it. Opening the innings in a twenty- over game at Forest Green, Clyde may have surprised many. With young, quick bowlers on a wet and deadly track Clyde shared a 60 partnership in 10 overs with the skipper, who eventually went on to make 70. Clyde’s subtle direction of the ball enabled a stand that set up Howard Owen’s exceptional innings that put the total beyond reach. Clyde always holds an end up and loves to play an end game, fighting for survival; he is good at it, even if it didn’t work at Waldron, where he, Richard Heller and Michael Kaye fought bravely. That said, to be honest we were poor there and deserved to lose. Clyde is now representing Surrey Over-70s, a standard of cricket that he describes as like playing (and watching) the game in slow motion! I am always grateful to hear his lucid thoughts on how the game should be played. Another Septuagenarian in the side, Michael Kaye appeared a couple of times this year, but alas, not often enough. Still galloping in to bowl Michael picked up 2 wickets but it was his catch in the close finish at Groombridge that is the best memory. Having yet again scored reasonably well batting first, with Nick Norman Butler getting 76, we had 168 to defend. On a glorious day on a great Groombridge track, it was probably not enough. Our flying start in the field was enabled by two outstanding catches. Michael saw the ball travelling past him at speed but he casually took it one handed to whoops from his teammates. Minutes later Andy Popperwell ran and caught low down with outstretched arms for another astonishing moment in the season. Sadly, these two magical moments weren’t quite enough to push us over the line. We lost by 2 wickets . Andy Popperwell continued to run the side with aplomb in his 25 year role as match secretary. He never complains; occasionally he offers his resignation. Without Andy there would be no team and no game. On the field, Pops continued his pursuit of the next hundred landmark in his wicket tally, sadly falling one short come the end of the season. Another memorable match took place at Hartley Witney, where Michael Cockerell returned his best figures of the year. With the opening bowlers having been punished by the club’s professional, who would come back and haunt us later, Michael turned the game in our favour, picking up 6-38. Michael took wickets steadily throughout the season claiming 28 victims, one behind the skipper. He put the ball just on the right length that seems to be programmed into his right arm,. With the bat Michael scored a rapid 16* in the Twenty-Twenty match against Central Brittany ensuring a respectable total.. The opening batsman in that game was Richard Heller, who played a positive role with Bobby Ancil. Richard ran with the enthusiasm that makes him one of the most loved cricketers I have ever played with. He also showed, in being dismissed only twice all season, that he deserves more opportunities higher up the order. In the field no man spends more time rolling around than Mr Heller. Off the field Richard brought the piano skills we first experienced in an off-season party at his home to a crêperie overlooking a lake. Bowling-wise it was great to see from his spell at Billericay that his ‘yips’ may be long gone- and long may that continue! The tours this year to Dorset, Suffolk and Central Brittany where we also played Nantes were, as always, enormous fun and we were joined on them by Will Scott Masson, who took a salmon-like leaping caught and bowled at Thornford in Dorset. John Hamer joined us in France, where he batted only weeks after a serious car accident. Also, Gary Kennedy turned out in Suffolk with his habitual great enthusiasm. He also played at Ballinger Waggoners where we lost to opponents who cunningly deployed high deliveries against the sun to dazzle the eyes of the batsmen.. One day, the Kennedy Swish will connect and he will make runs for the Bushmen and I look forward to that happening. Bernie Spratt was in Dorset, part of a Bushmen contingent which engaged in post-match banter with the locals after the game at Hooke and Powerstock, I hear. – Judging by the condition of my brother the following day this was an occasion I really should have attended. In conclusion, we won a fair few games, lost some we deserved to, others we didn’t, but I hope that you, like me, enjoyed the sunny summer of 2013. Perhaps my favourite statistic of the year is that the bird-fancying Bushmen made 10 fifties – and 34 ducks. After the hors d’oeuvres, the record of the Bushmen averages for 2013. Dear Bushman – please excuse the somewhat inebriated execution of these averages. There is a conflict between the Captain’s original columns and the translated Sanskrit. Ed. Here is the latest news about this year’s cricket fixtures. Courtesy of Any Pop. This is definitive…….until it changes. Ed. Sun 15 June Ashwell uncertain……. Sat 20 Sept ) European Tour? Another Season, another reason for making cricket. Lyndon Jones skippered the Bushmen for their first fixture of the season at Farleigh Wallop. Here is the gallimaufry of weak excuses being passed off as a match report. Eleven Bushmen, a year older and no better looking, arrived at Farleigh Wallop for the season’s first fixture. A fine spring day, jewels of dew on the forgiving turf, and the waft of wild garlic in the crisp Hampshire air. Fielding first, it soon became clear that a low slow pitch offered little to the bowlers and much to Farleigh’s batsmen, who tackled the Bushmen bowling with vigour. Despite some close shaves, and sustained pressure from Will Jones, the Farleigh Wallop openers remained at the crease past the halfway mark, both scoring 50s. Eventually Simon Israel made the first breakthrough, thanks to a fine catch by Ted Walters at square leg. The eventual outcome was 239-6 after 40 overs, and although this total always looked a tall order for the Bushmen, keeping the home side to 6 / over represented a creditable effort for the season’s first game. Simon in particular stood out, persevering to bowl a disciplined and incisive 8 over spell for three wickets. It also was great to see Howard Owens back on song, bowling an invaluable 6 overs. The Bushmen batting was pretty disappointing – the shock of two-and-a-half hours in the field always a tough wake-up call after the winter – but John Whitehead dug in for a resilient 25, and Simon Israel again displayed commendable application, sticking around to the bitter, and chilly, end for a very respectable 30-odd. Not the start to the season we might have wished for, but the Bushmen is not a side short on wisdom or endurance. We march on, bloodied but unbowed…. Having produced a snide intro to the last match report allow me to make up for my peccadillo by saying – “That’s more like it, Lynd”. Ed. Another visit to Fernhurst, another remarkable Sunday afternoon. A perfect May day, cloud-dabbed blue sky presiding over a verdant idyll: England at its loveliest, and no surprise that Elgar’s Cello Concerto was penned just a few miles down the road. Fernhurst’s captain (who presided over the afternoon with absolute grace) won the toss and led his team out. Featuring a good number from the club’s thriving junior section, Fernhurst could perhaps have been stronger, but we won’t have to wait long before those same players will throw down quite a challenge. The Bushmen batting performance was exemplary. Each player applied himself well, no wicket fell softly, and the batting card was a genuine team effort, a series of gutsy performances: Mowbray Jackson (22), Simon Marcus (46), Will Jones (32) and a sparky 27 not out from Pianki Assegai at the death. With a generous helping of extras, the innings wrapped at tea with the Bushmen on a decent 187 for 5. Tea at Fernhurst is excellent, and a certain sense of undertow accompanied the Bushmen’s return to the field. Opening spells from Pianki and Will were lively; though not garnering wickets, they succeeded in keeping the game within the Bushmen’s control. Our total looking secure, it was time for Andy Popp and Clyde Jeavons to get to work. Please excuse a brief aside: at Pinkney’s Green last September I ran as hard as my aging legs would convey me, in an effort to make the catch that would have taken Andy’s career tally to 200. I failed, and guilt has pursued me through the winter, along with the broken finger that I never even bothered mention, knowing the only possible response would have been ‘serves you bl**dy well right’. Back to Andy. Not content with wicket 200, he decides to bag four more while he’s at it, turning in a quite stupendous 5-59. Meanwhile at the other end, Clyde ‘it’s the end of May, I haven’t had a single wicket yet, maybe it’s time to pack it all in, oh dear oh dear, what’s the point’, (continued on page 94) Jeavons steps up to the crease. With the wryest of smiles, the umpire asks if it’s right arm fast. No, not really. But it was effective – 5 for 29 even put a smile on Clyde’s face. So the last two visits to Fernhurst have seen three Bushmen bowlers pick up five wickets – long may our good fortune continue. It was also one of those days when the right fielders just happened to be in the right place – Ted, Will, and Pianki all took cracking catches that helped tiller the game our way. A genuinely terrific team effort – well done the lads. And so say all of us. Ed.